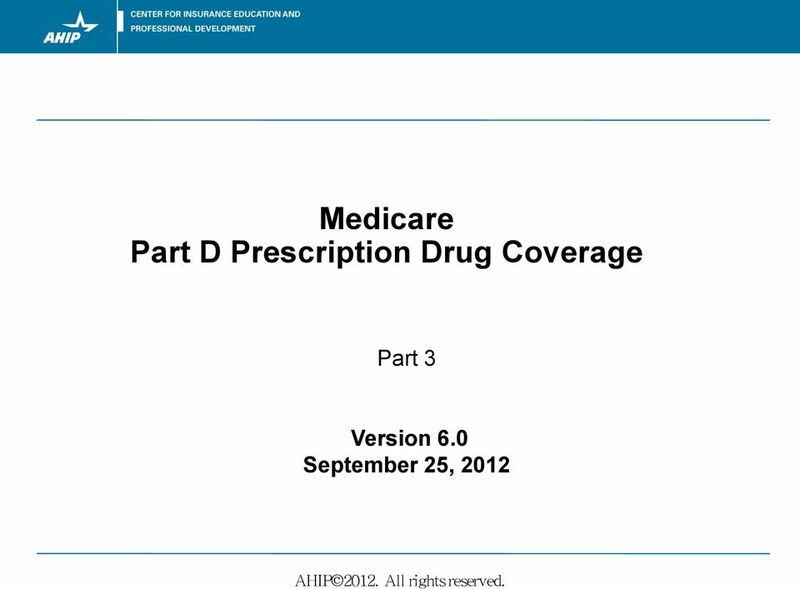 Download "Medicare Part D Prescription Drug Coverage"
2 Terms and Conditions This training program is protected under United States Copyright laws, 17 U.S.C.A. 101, et seq. and international treaties. Except as provided below, the training program may not be reproduced (in whole or in part) in hard paper copy, electronically, or posted on any web site or intranet without the prior written consent of AHIP. Any AHIP member company in good standing sponsoring a Medicare Advantage or Part D plan may reproduce the training program for the limited purpose of providing training and education to the company s own employees and contractors on the subject matter contained in the training program. Employees or contractors participating in such training may not further reproduce (in whole or in part) the training program. 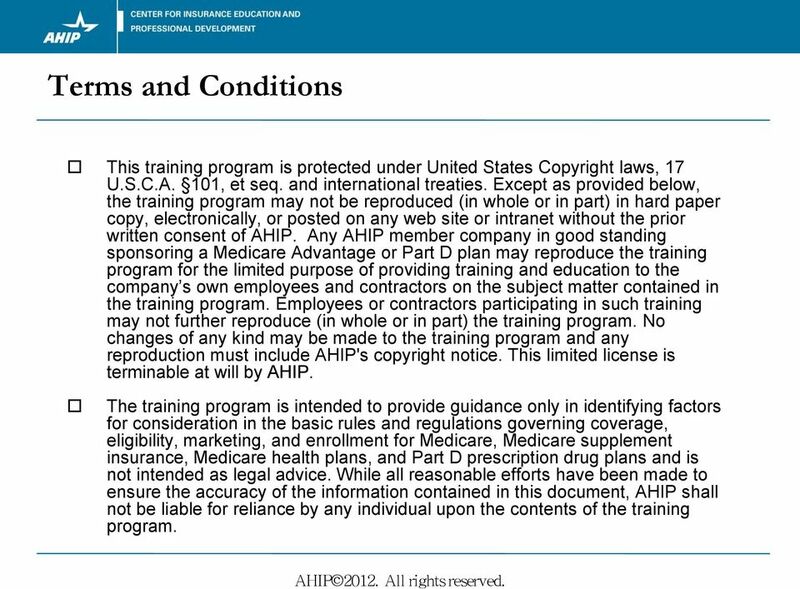 No changes of any kind may be made to the training program and any reproduction must include AHIP's copyright notice. This limited license is terminable at will by AHIP. The training program is intended to provide guidance only in identifying factors for consideration in the basic rules and regulations governing coverage, eligibility, marketing, and enrollment for Medicare, Medicare supplement insurance, Medicare health plans, and Part D prescription drug plans and is not intended as legal advice. While all reasonable efforts have been made to ensure the accuracy of the information contained in this document, AHIP shall not be liable for reliance by any individual upon the contents of the training program. 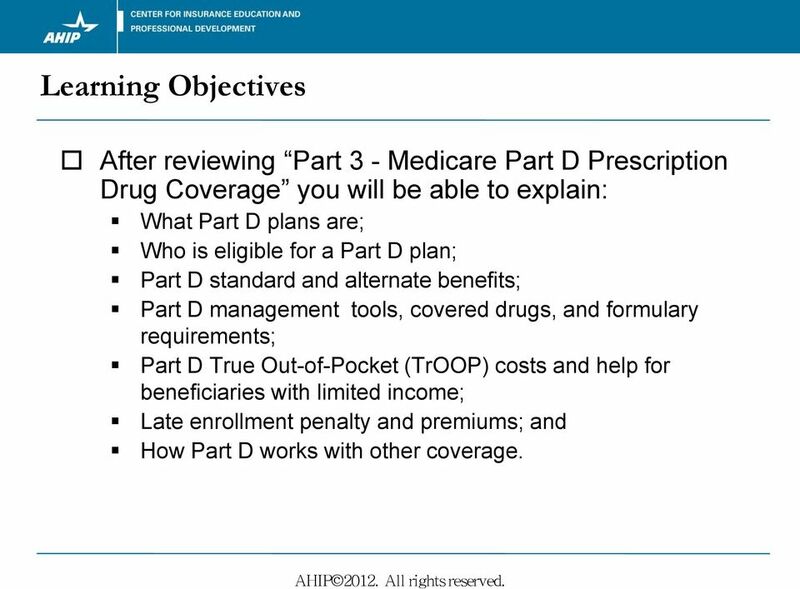 3 Learning Objectives After reviewing Part 3 - Medicare Part D Prescription Drug Coverage you will be able to explain: What Part D plans are; Who is eligible for a Part D plan; Part D standard and alternate benefits; Part D management tools, covered drugs, and formulary requirements; Part D True Out-of-Pocket (TrOOP) costs and help for beneficiaries with limited income; Late enrollment penalty and premiums; and How Part D works with other coverage. 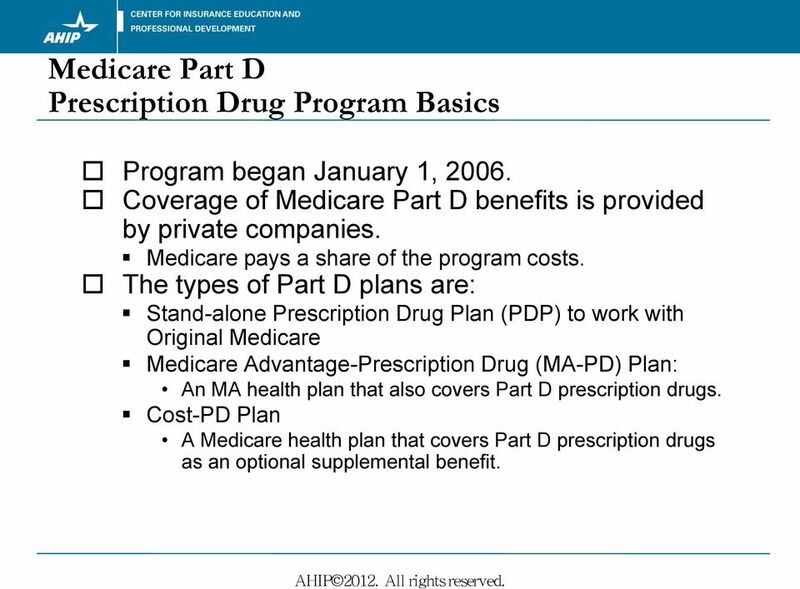 4 Medicare Part D Prescription Drug Program Basics Program began January 1, Coverage of Medicare Part D benefits is provided by private companies. Medicare pays a share of the program costs. The types of Part D plans are: Stand-alone Prescription Drug Plan (PDP) to work with Original Medicare Medicare Advantage-Prescription Drug (MA-PD) Plan: An MA health plan that also covers Part D prescription drugs. 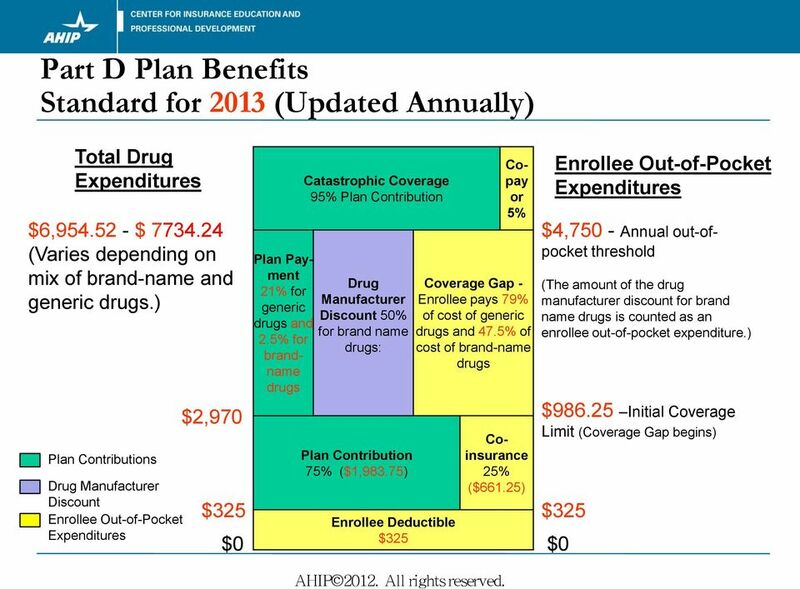 Cost-PD Plan A Medicare health plan that covers Part D prescription drugs as an optional supplemental benefit. 5 Medicare Part D Eligibility Individuals entitled to Part A and/or enrolled under Part B are eligible to enroll in Part D plans. The beneficiary must live in the plan s service area. 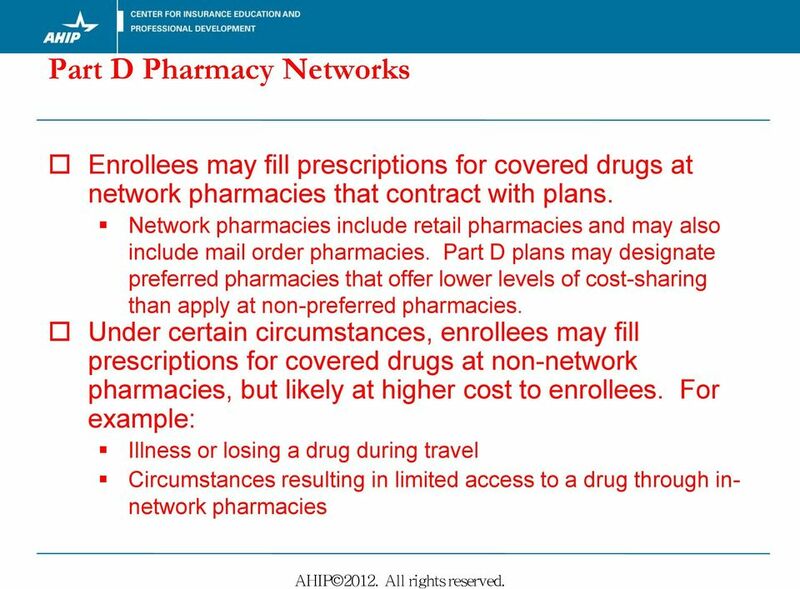 Part D plan coverage is provided through network pharmacies in the Part D plan s service area, except that PFFS plans are not required to use a pharmacy network. 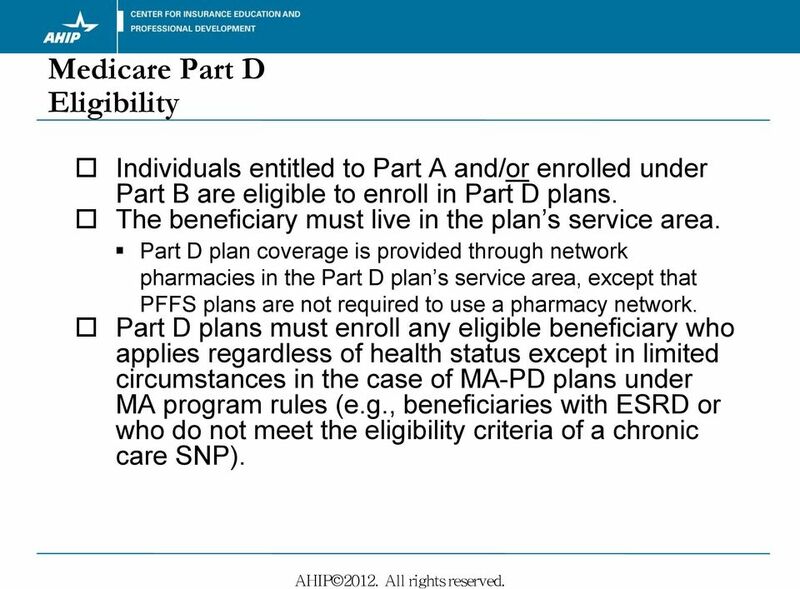 Part D plans must enroll any eligible beneficiary who applies regardless of health status except in limited circumstances in the case of MA-PD plans under MA program rules (e.g., beneficiaries with ESRD or who do not meet the eligibility criteria of a chronic care SNP). 6 Part D Plan Benefits Standard Part D plans must cover at least the Part D standard benefit or its actuarial equivalent. 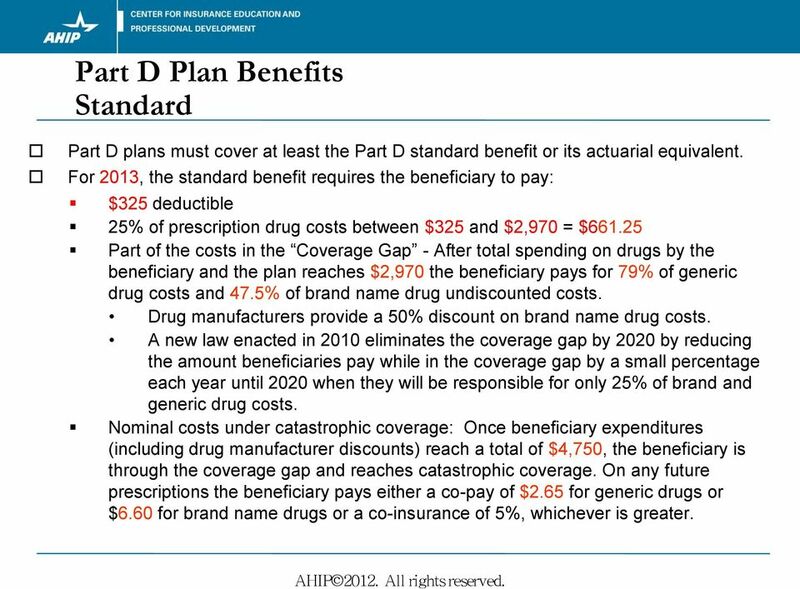 For 2013, the standard benefit requires the beneficiary to pay: $325 deductible 25% of prescription drug costs between $325 and $2,970 = $ Part of the costs in the Coverage Gap - After total spending on drugs by the beneficiary and the plan reaches $2,970 the beneficiary pays for 79% of generic drug costs and 47.5% of brand name drug undiscounted costs. Drug manufacturers provide a 50% discount on brand name drug costs. A new law enacted in 2010 eliminates the coverage gap by 2020 by reducing the amount beneficiaries pay while in the coverage gap by a small percentage each year until 2020 when they will be responsible for only 25% of brand and generic drug costs. Nominal costs under catastrophic coverage: Once beneficiary expenditures (including drug manufacturer discounts) reach a total of $4,750, the beneficiary is through the coverage gap and reaches catastrophic coverage. On any future prescriptions the beneficiary pays either a co-pay of $2.65 for generic drugs or $6.60 for brand name drugs or a co-insurance of 5%, whichever is greater. 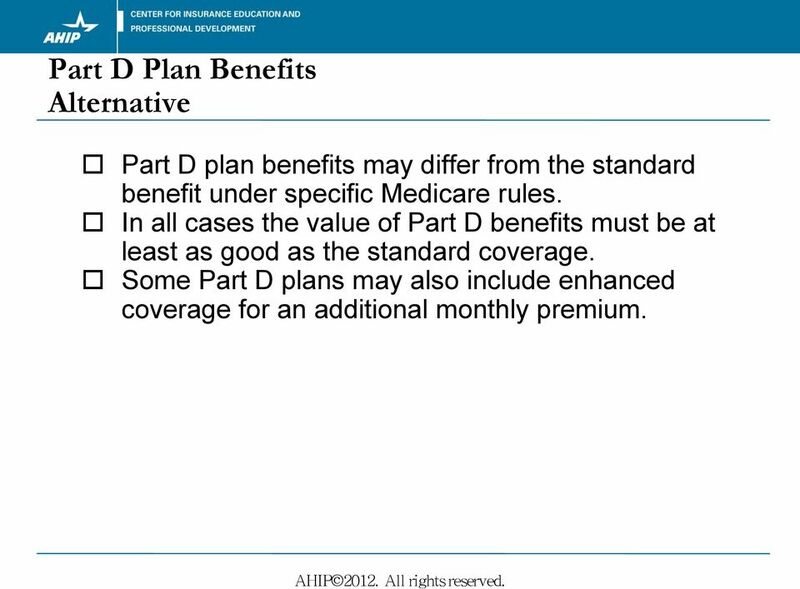 8 Part D Plan Benefits Alternative Part D plan benefits may differ from the standard benefit under specific Medicare rules. In all cases the value of Part D benefits must be at least as good as the standard coverage. Some Part D plans may also include enhanced coverage for an additional monthly premium. 11 Part D Drug Management Tools, cont d. Part D plans commonly use a variety of prescription drug benefit management tools, including: Step therapy: One or more similar lower cost drugs must be tried before other more costly drugs are tried, if necessary. Prior authorization: Requires the doctor to contact the plan before the plan will cover these prescriptions. The doctor must show the drug is medically necessary for it to be covered. 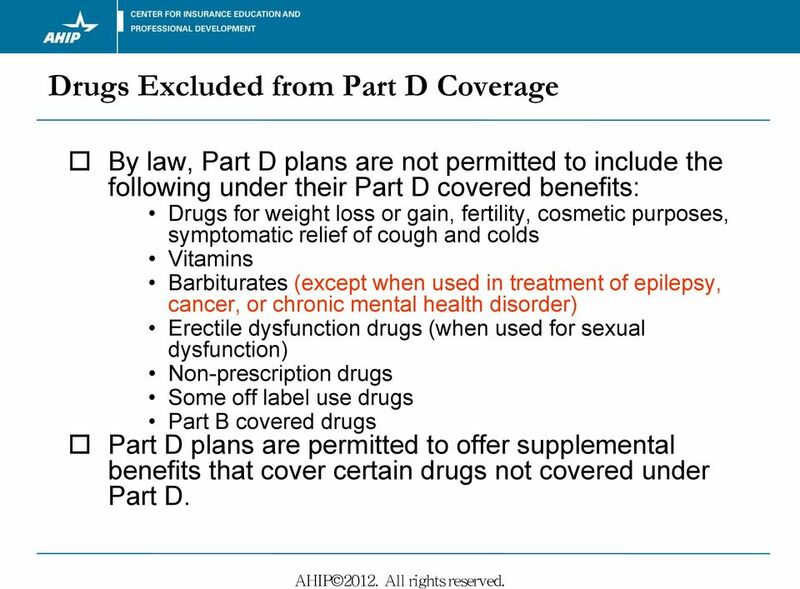 12 Covered Part D Drugs By law, Part D plans are permitted to cover any prescription drugs and biologicals that: Must be covered by states that provide Medicaid prescription drug benefits Many Part D plans do not cover all of these drugs because in some cases several similar drugs are available to treat the same medical condition. 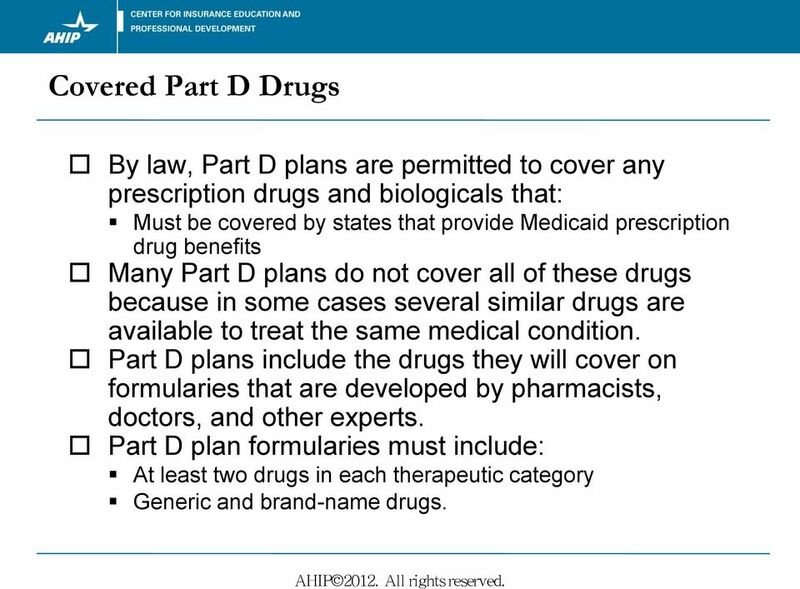 Part D plans include the drugs they will cover on formularies that are developed by pharmacists, doctors, and other experts. 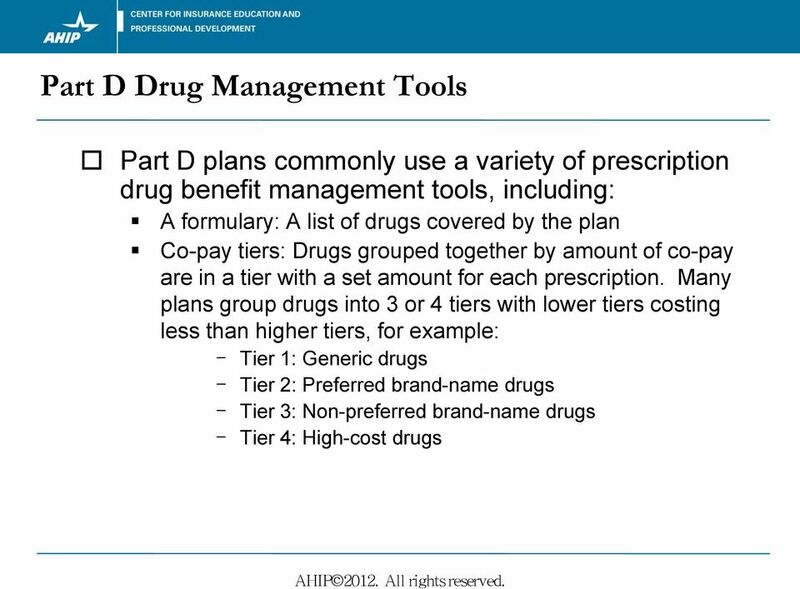 Part D plan formularies must include: At least two drugs in each therapeutic category Generic and brand-name drugs. 13 Drugs Excluded from Part D Coverage By law, Part D plans are not permitted to include the following under their Part D covered benefits: Drugs for weight loss or gain, fertility, cosmetic purposes, symptomatic relief of cough and colds Vitamins Barbiturates (except when used in treatment of epilepsy, cancer, or chronic mental health disorder) Erectile dysfunction drugs (when used for sexual dysfunction) Non-prescription drugs Some off label use drugs Part B covered drugs Part D plans are permitted to offer supplemental benefits that cover certain drugs not covered under Part D.
14 Mid-year Formulary Changes Formulary changes must be approved by CMS Part D plans cannot make any formulary changes during the first 60 days of the contract year, unless it is in response to a drug s removal from the market. 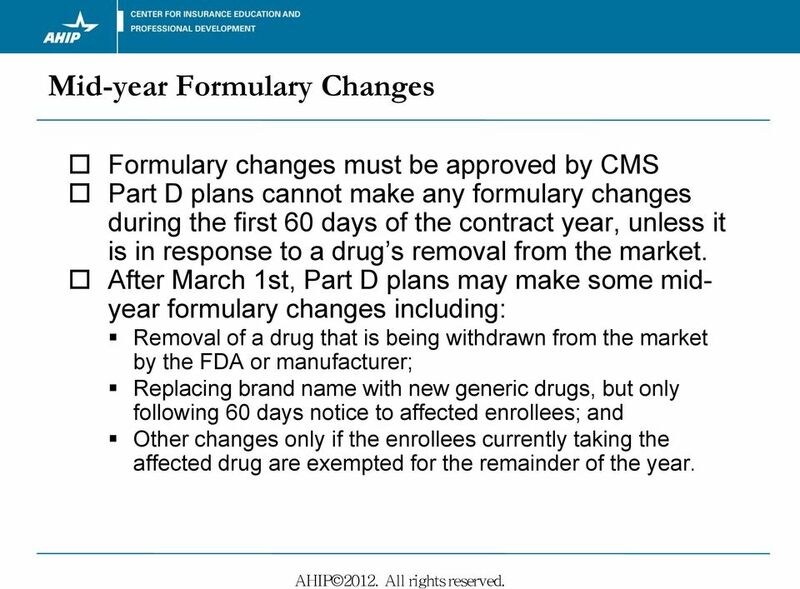 After March 1st, Part D plans may make some midyear formulary changes including: Removal of a drug that is being withdrawn from the market by the FDA or manufacturer; Replacing brand name with new generic drugs, but only following 60 days notice to affected enrollees; and Other changes only if the enrollees currently taking the affected drug are exempted for the remainder of the year. 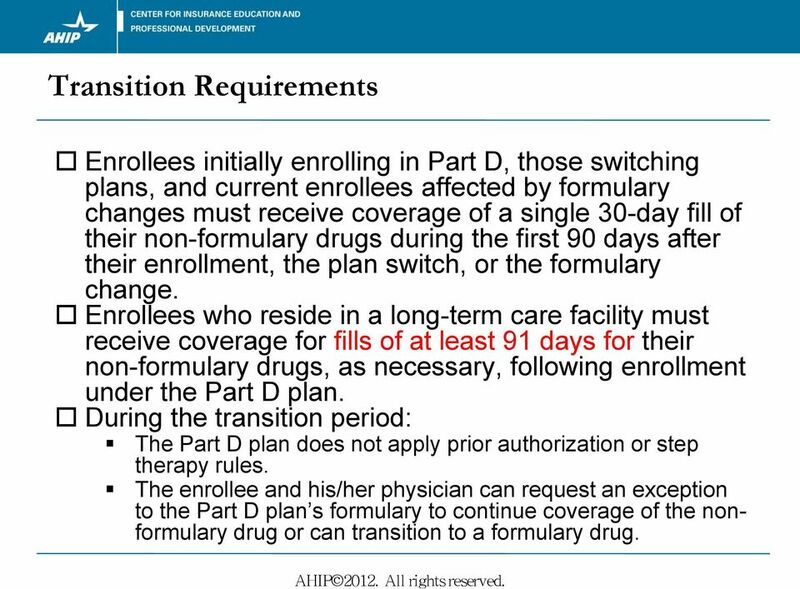 15 Transition Requirements Enrollees initially enrolling in Part D, those switching plans, and current enrollees affected by formulary changes must receive coverage of a single 30-day fill of their non-formulary drugs during the first 90 days after their enrollment, the plan switch, or the formulary change. Enrollees who reside in a long-term care facility must receive coverage for fills of at least 91 days for their non-formulary drugs, as necessary, following enrollment under the Part D plan. 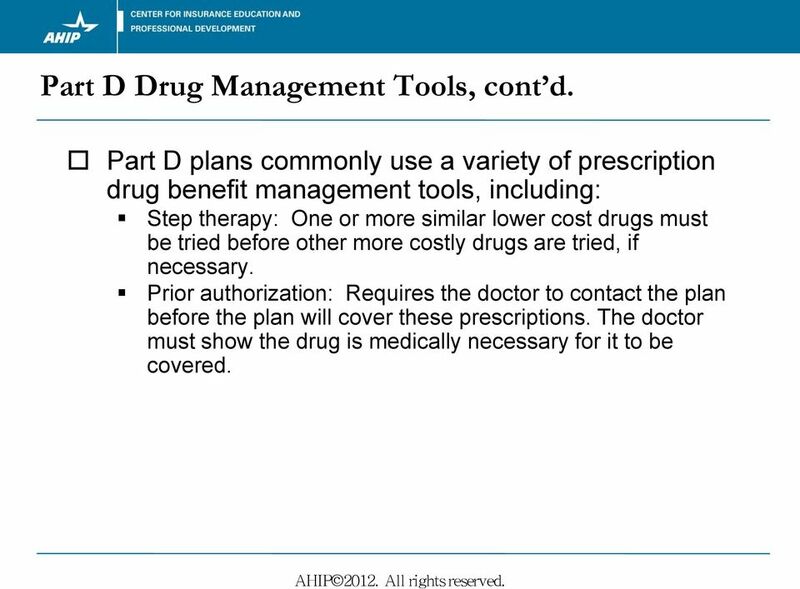 During the transition period: The Part D plan does not apply prior authorization or step therapy rules. The enrollee and his/her physician can request an exception to the Part D plan s formulary to continue coverage of the nonformulary drug or can transition to a formulary drug. 16 Requesting Exceptions for Drugs Enrollees have the right to request a formulary exception for coverage either of non-formulary drugs or of formulary drugs at a less costly formulary tier. If a doctor thinks an enrollee needs a drug that is not on the list, the enrollee or the doctor can apply for a formulary exception. 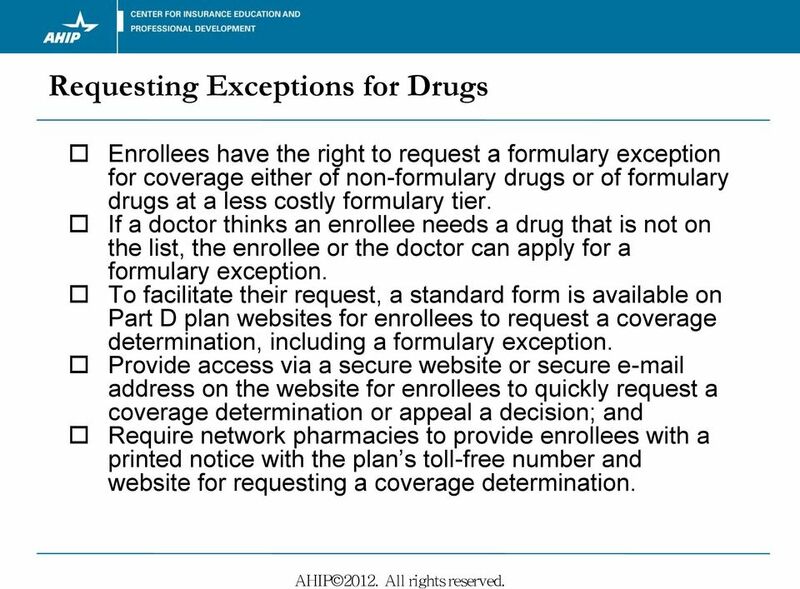 To facilitate their request, a standard form is available on Part D plan websites for enrollees to request a coverage determination, including a formulary exception. Provide access via a secure website or secure address on the website for enrollees to quickly request a coverage determination or appeal a decision; and Require network pharmacies to provide enrollees with a printed notice with the plan s toll-free number and website for requesting a coverage determination. 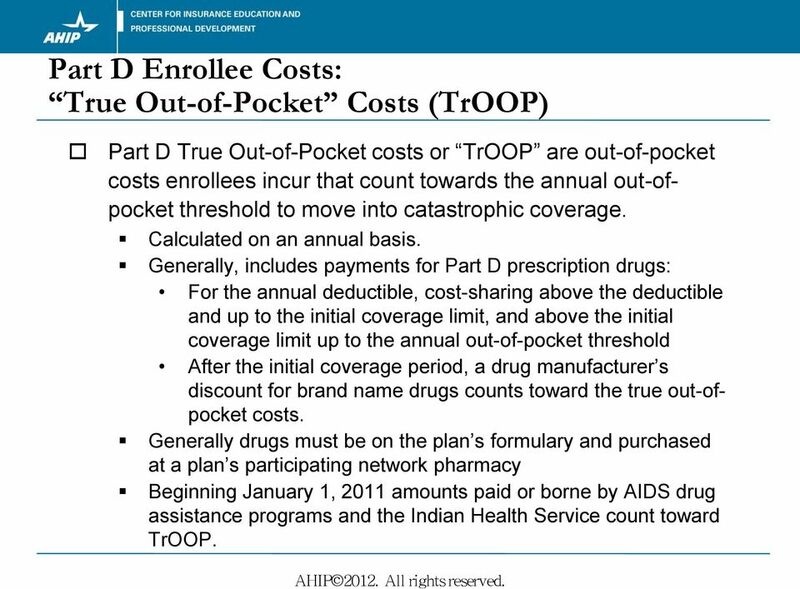 17 Part D Enrollee Costs: True Out-of-Pocket Costs (TrOOP) Part D True Out-of-Pocket costs or TrOOP are out-of-pocket costs enrollees incur that count towards the annual out-ofpocket threshold to move into catastrophic coverage. Calculated on an annual basis. Generally, includes payments for Part D prescription drugs: For the annual deductible, cost-sharing above the deductible and up to the initial coverage limit, and above the initial coverage limit up to the annual out-of-pocket threshold After the initial coverage period, a drug manufacturer s discount for brand name drugs counts toward the true out-ofpocket costs. Generally drugs must be on the plan s formulary and purchased at a plan s participating network pharmacy Beginning January 1, 2011 amounts paid or borne by AIDS drug assistance programs and the Indian Health Service count toward TrOOP. 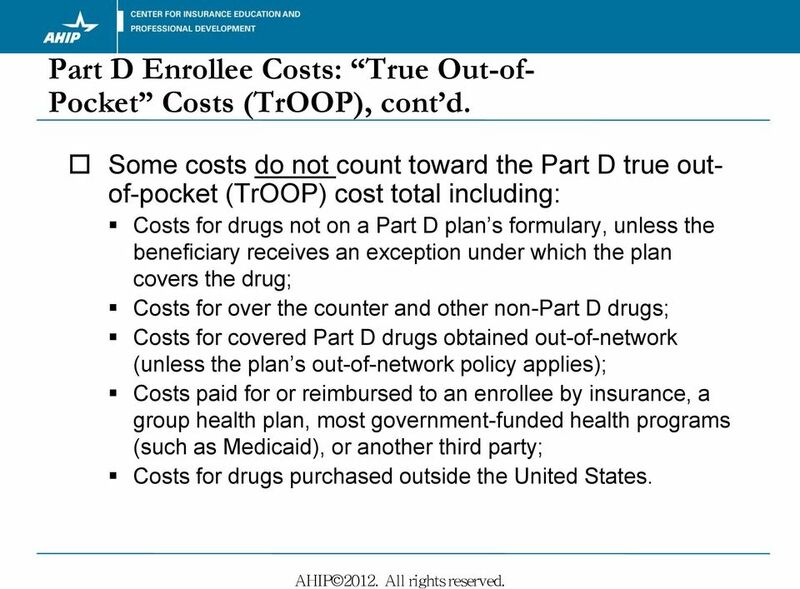 18 Part D Enrollee Costs: True Out-of- Pocket Costs (TrOOP), cont d. Some costs do not count toward the Part D true outof-pocket (TrOOP) cost total including: Costs for drugs not on a Part D plan s formulary, unless the beneficiary receives an exception under which the plan covers the drug; Costs for over the counter and other non-part D drugs; Costs for covered Part D drugs obtained out-of-network (unless the plan s out-of-network policy applies); Costs paid for or reimbursed to an enrollee by insurance, a group health plan, most government-funded health programs (such as Medicaid), or another third party; Costs for drugs purchased outside the United States. 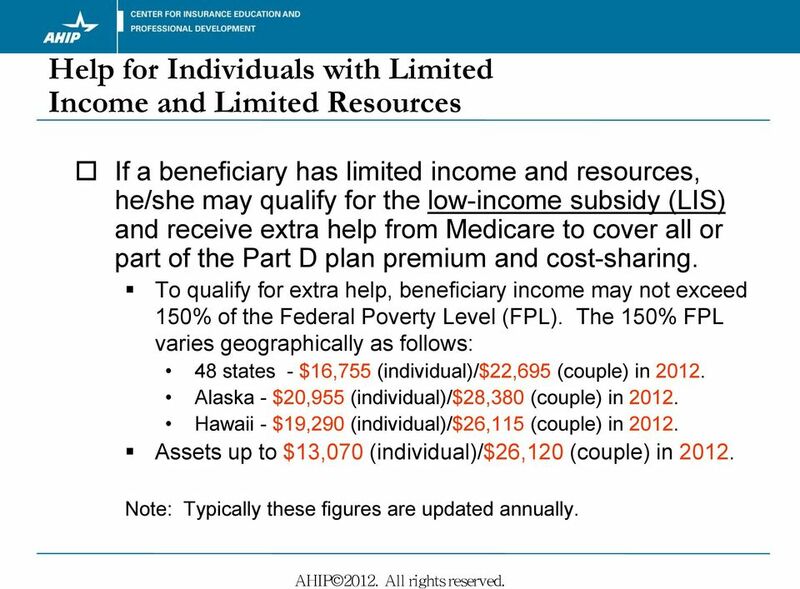 19 Help for Individuals with Limited Income and Limited Resources If a beneficiary has limited income and resources, he/she may qualify for the low-income subsidy (LIS) and receive extra help from Medicare to cover all or part of the Part D plan premium and cost-sharing. To qualify for extra help, beneficiary income may not exceed 150% of the Federal Poverty Level (FPL). The 150% FPL varies geographically as follows: 48 states - $16,755 (individual)/$22,695 (couple) in Alaska - $20,955 (individual)/$28,380 (couple) in Hawaii - $19,290 (individual)/$26,115 (couple) in Assets up to $13,070 (individual)/$26,120 (couple) in Note: Typically these figures are updated annually. 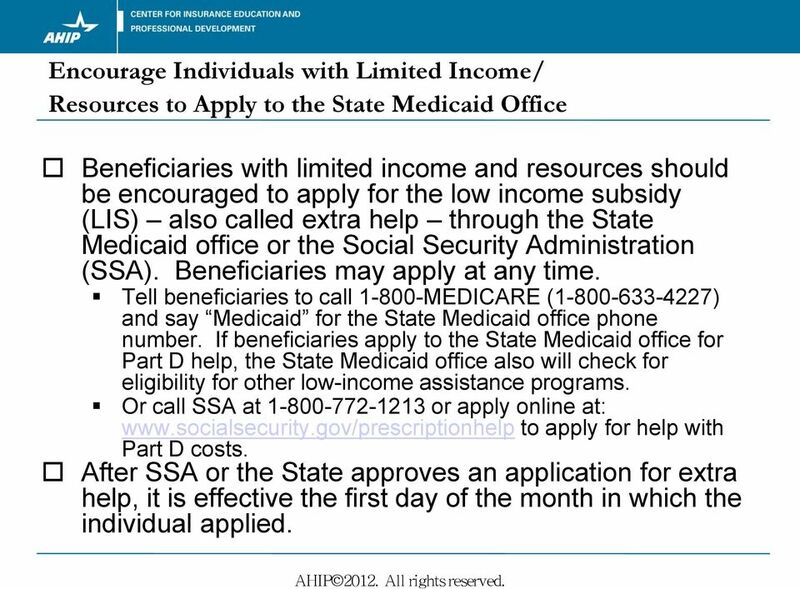 20 Encourage Individuals with Limited Income/ Resources to Apply to the State Medicaid Office Beneficiaries with limited income and resources should be encouraged to apply for the low income subsidy (LIS) also called extra help through the State Medicaid office or the Social Security Administration (SSA). Beneficiaries may apply at any time. Tell beneficiaries to call MEDICARE ( ) and say Medicaid for the State Medicaid office phone number. If beneficiaries apply to the State Medicaid office for Part D help, the State Medicaid office also will check for eligibility for other low-income assistance programs. Or call SSA at or apply online at: to apply for help with Part D costs. After SSA or the State approves an application for extra help, it is effective the first day of the month in which the individual applied. 21 Other Help For Low-Income Pharmaceutical Assistance Programs Some pharmaceutical manufacturers operate programs directly or indirectly that assist low income individuals in obtaining drugs at reduced or no costs. Some states have assistance programs designed specifically for their residents. Some programs are qualified State Pharmaceutical Assistance Programs or SPAPs that count towards TrOOP and some do not count towards TrOOP. Becoming familiar with your state s programs may help a beneficiary address cost-sharing for prescriptions, particularly in the coverage gap. 22 Assistance Programs What Counts toward TrOOP? Enrollees may receive assistance for Part D costs, but costs paid by many assistance programs do not count toward the true out-of-pocket (TrOOP) cost. Included entities costs do count towards TrOOP for: Qualified State Pharmaceutical Assistance Programs (SPAPs), most charities, non-government and Indian Health Service funded tribal coverage, AIDS Drug Assistance Programs, health savings accounts, flexible spending accounts, and medical savings accounts. Excluded entities costs do not count towards TrOOP for: Medicaid, State Children s Health Insurance Program (CHIP), Federally Qualified Health Centers, Rural Health Clinics, Patient Assistance Programs (PAPs) outside the Part D benefit, TRICARE, Federal Employees Health Benefits Program (FEHBP), Black Lung Funds, and health reimbursement arrangements. 23 Part D Late Enrollment Penalty If a beneficiary does not enroll when first eligible or there is a subsequent gap in Part D coverage of more than 63 continuous days, he/she may pay a penalty to join a Part D plan later. If there has been a period of at least 63 continuous days following his/her initial enrollment period for Part D during which the beneficiary did not have either Part D or any other prescription drug coverage that was creditable (coverage that expects to pay, on average, at least as much as Medicare s standard Part D coverage expects to pay), when the beneficiary joins a Part D plan, generally the premium will go up by 1% of the national average beneficiary premium for each month he/she did not have such coverage. 24 Late Enrollment Penalty, cont d. In general, the penalty is in effect as long as the beneficiary has Medicare prescription drug coverage. Beneficiaries who qualify for the low-income subsidy are not subject to the late enrollment penalty as long as they are not disenrolled from their Part D or other creditable drug coverage for 63 days or longer. 25 Part D Premium Payment Part D enrollees have three options for paying their Part D premium. (1) Automatic electronic monthly mechanism, such as withdrawal from their checking or savings bank account or automatic deduction from their credit or debit card; (2) Direct monthly billing from the plan; or (3) Automatic deduction from their monthly Social Security Administration (SSA) benefit check. Typically it takes 2-3 months for SSA withholding to begin or end. When withholding begins, it will be for the 2-3 months of premiums owed. If a beneficiary is considering this option, he/she should call the plan first. Generally the beneficiary must stay with the premium payment option for the entire year. 26 Employer/Union Coverage of Drugs Employer or Union Coverage: Employers/unions will tell their employees whether their prescription drug coverage is creditable (coverage that, on average, equals at least as much as Medicare s standard Part D coverage expects to pay). If coverage is creditable and the beneficiary keeps it, he/she will not incur a premium penalty if he/she later loses or drops the employer coverage and joins a Part D plan. If coverage is not creditable, the beneficiary will need to enroll in Medicare Part D during his/her initial eligibility period to avoid the late enrollment penalty. If a beneficiary has creditable drug coverage through TriCare, the VA, or the FEHBP, he/she can compare that coverage with available Part D plans to decide whether to enroll in Part D.
27 Employer Coverage of Drugs, cont d. The beneficiary should check with the employer or union benefits administrator before making any change. If a beneficiary drops employer/union prescription drug coverage, he/she may not be able to get it back and also may lose health coverage. If the beneficiary retires or otherwise loses employer/union creditable coverage and joins a Medicare Part D plan or otherwise obtains creditable drug coverage within 63 days, there will not be a late enrollment penalty. 28 Beneficiaries in Original Medicare with Medigap Drug Coverage Medigap plans H, I, and J with drug coverage could no longer be sold as of January 1, Some beneficiaries may have decided to keep their Medigap policy with the drug coverage they had before January 1, Insurers are required to notify beneficiaries annually whether or not the prescription drug coverage they have is creditable (coverage that expects to pay, on average, at least as much as Medicare s standard Part D coverage expects to pay). 29 Beneficiaries in Original Medicare with Medigap Drug Coverage, cont d. For beneficiaries who decided to keep their Medigap policy with the drug coverage they had before January 1, They may continue to keep the Medigap policy with drug coverage; OR They may keep their Medigap coverage with the drug portion of the coverage removed and enroll in a Part D PDP plan; OR They may drop their Medigap coverage and enroll in a MA-PD plan or other health plan with a PDP. If these beneficiaries choose a Part D plan now, they must pay a Part D late enrollment penalty unless their Medigap coverage was creditable. Note: See Part 1, Medicare Program Basics, for more information on Original Medicare and Medigap (Medicare supplement insurance). 30 Medicaid Drug Coverage Most prescription drugs that were previously covered by Medicaid are now covered under Medicare Part D. When a Medicaid beneficiary becomes eligible for Medicare, then Medicare, instead of Medicaid, covers the Part D drugs once the beneficiary is enrolled in a Part D plan. Medicaid beneficiaries can compare plans and choose a Medicare Part D plan. If they don t choose a plan, Medicare will select one for them. Medicaid beneficiaries can change Part D plans throughout the year. 31 For Additional Information Medicare s site on Part D prescription drug coverage for beneficiaries. Medicare s information site on Part D prescription drug coverage for Part D sponsoring organizations. Medicare & You Handbook.